I haven't been baking a lot of late nor been very active here. Apologies and thank you for still being around! 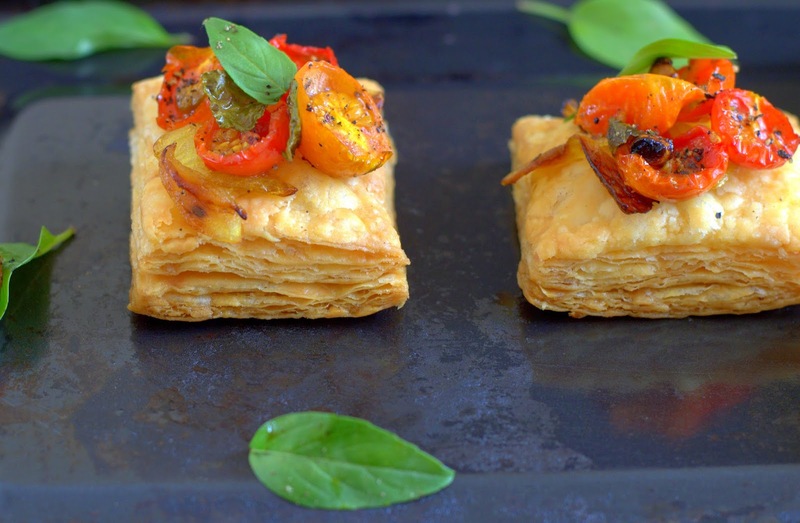 Glad to have some home made rough puff pastry in my freezer, versatile and so convenient. Indulgent stuff like these Orange Curd filled Mille Feuille or with just some cinnamon sugar sprinkled on top, you could churn out sweet some things without much effort. Think savory and you could probably use just about anything you fancy or have on hand. Thaw the frozen pastry overnight in the fridge, roll and bake the next day. Some extra baked pastry I had dumped in the freezer was good too. Warm, flaky puffs in minutes literally, what's not to love? My sister who ate home made puff pastry for the first time, was very pleased with the buttery flavor. It is rich of course, best eaten as an indulgence. Not a bad idea really, you must have some of this pastry in your freezer. Makes me wish I had air-conditioning in my kitchen so I would never run out of puff pastry ever! Made these tartlettes topped with sweet caramelized onions, tart roasted cherry tomatoes, garlic and basil. (This has to be one of the most common recipes you will find!) Simple, flavorful! Ingredients : It is hard to specify exact quantities of both the pastry and the topping. Here is an approximate. Better to have more of the pastry and topping than less! Thaw the pastry (still wrapped) overnight in the fridge. Be sure you work in a cool kitchen, preferably cooler hours of the day. If making the rough puff pastry the ideal temperature should be around 18 C.
If the pastry is still very firm, leave it in the wrap on the counter till it is fairly firm but pliable enough to roll without a lot of pressure. Excessive pressure may glue the layers together! Line a baking tray with parchment. Dust the counter lightly with flour. Roll the pastry about 4 -5 mm thick. Using a pizza cutter and a ruler as a guide, cut into 2'' squares. Pre-heat oven to 180 C / 350 F. Bake the pastry for about 25-30 minutes (depending on the thickness) or till golden and crisp. Store air tight if not using immediately. I have refrigerated and also frozen the baked pastries at this point, worked well for me! Slice the onions about 3-4 mm thick. Heat 1 tablespoon oil in a wide pan. Tip in the onions and cook on low heat stirring now and then, till the onions are soft but not mushy, golden and caramelized. Add 1/2 tsp sugar and salt to taste. Please do check this link for caramelizing onions just right. Lightly grease a large baking tin. 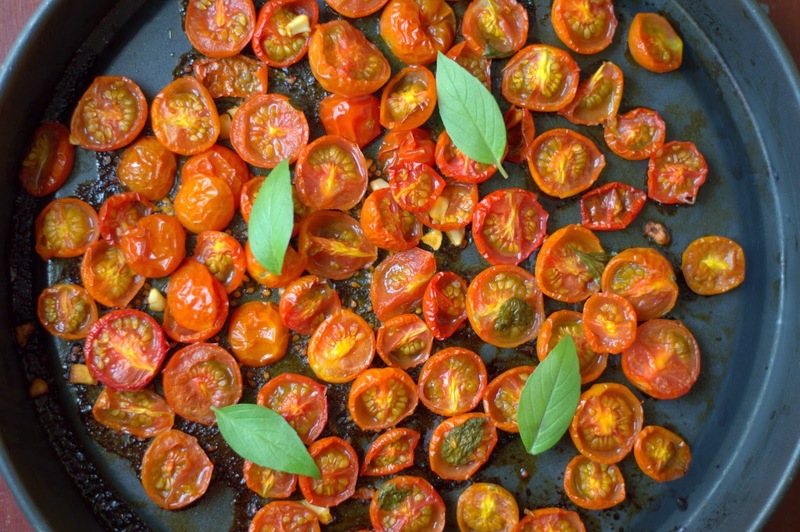 Toss together the tomatoes, garlic, salt and pepper, top with the basil. Place tomatoes cut side up, bake in a 180 C preheated oven for about 30 minutes or till the tomatoes are done. Be careful not to over bake or they will turn chewy and dry. To serve. Top each tartlet with some of the caramelized onions and some roasted tomatoes. I liked it with lots of onion with the tomatoes as it helps balance the tartness. Warm in a 180 C oven for 5 minutes. Garnish with fresh basil and serve immediately. Please note : These tartlettes were a result a new recipe in quest of easier pastry. It was fairly good of course, but Ieft a couple of questions in my mind. Can't wait to make it again! 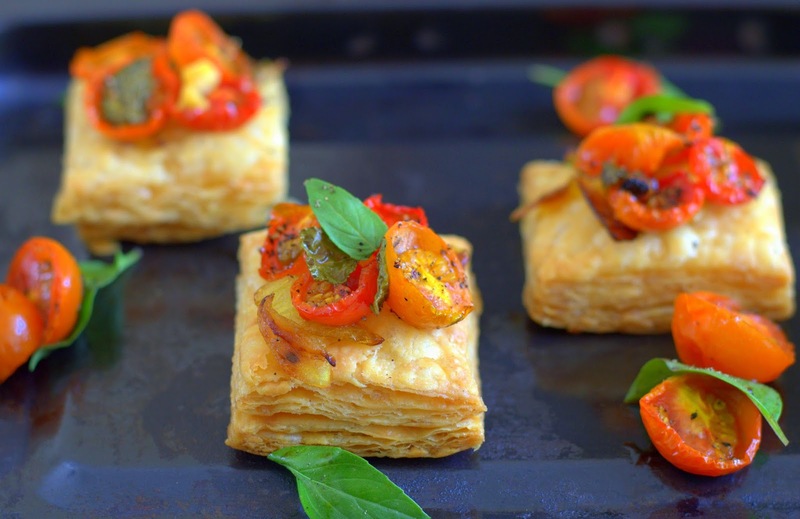 You could try this recipe above or use store bought puff pastry. Which is your favorite recipe for rough puff pastry? Tell me how I can use the rest of the pastry in my freezer! A step by step photos of the recipes in the blog will be appreciated. Pl note it for the convenience of readers.